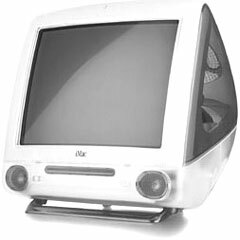 The last revision of G3 iMacs was released in July 2001 in speeds of 500, 600, and 700 MHz – the fastest G3 iMac Apple ever shipped. All of the models introduced in July 2001 include an 8x CD-RW drive, the same Rage 128 Ultra graphics (with 16 MB of RAM) used in the previous generation, at least 128 MB of RAM, and the PowerPC 750CXe CPU with its built-in 256 KB cache. The 500 MHz iMac sold for US$999, the 600 MHz iMac for $1,299, and the 700 MHz iMac for $1,499 (the 700, which included 256 MB of RAM, wasn’t available until August). Apple introduced a 500 MHz CD-ROM version in January 2002, which only included 64 MB of RAM. Each CD-RW version was available in snow (white). The 500 MHz model was available in indigo, and the faster two models were available in graphite. Got an iMac? Join our iMac Group or iMacs & eMacs Forum. Hard drive: 20/40/60 GB Ultra ATA drive. Maximum IDE drive size is 128 GB without third-party support. See How Big a Hard Drive Can I Put in My iMac, eMac, Power Mac, PowerBook, or iBook? for your options. The good, the bad, and the ugly of Apple design, Charles W Moore, Miscellaneous Ramblings, 2008.10.15. Apple has produced some beautiful computers and iPods over the years, but also a few of the ugliest and most ungainly computers ever seen. New ‘Books have better displays, digital vs. analog audio I/O, Craigslist restrictions, and more, Charles W Moore, Miscellaneous Ramblings, 2009.07.15. Also three browsers – Opera, Stainless, and Cruz – compared, and installing Mac OS X from DVD on a Mac that can’t mount DVDs. Using FireWire Target Disk Mode to install OS X on Macs without DVD drives, Charles W Moore, Miscellaneous Ramblings, 2006.09.14. Two methods for using FireWire Target Disk mode to install OS X on a Mac that can’t read DVDs. iMacs released in February 2001 and July 2001 should have iMac Power Management Update 1.1 installed to solve a problem with losing PRAM settings when the computer is disconnected from power for an extended period of time. See Knowledge Base article 120048 for full details. The iMac loads the MacOS Toolbox into RAM, unlike earlier Macs which use it from ROM. You lose the use of 3 MB of memory but gain faster performance.